Choosing wood flooring for your rooms? Solid wood flooring is the most versatile and beloved of all flooring types. It crosses all styles boundaries and works with every type of property – from country cottages to contemporary city apartments. Warmer than stone and ceramic, more hygienic and easier to clean than carpet, many of the latest ranges have tough, durable finishes that make it a truly practical choice. How much does solid wood flooring cost? 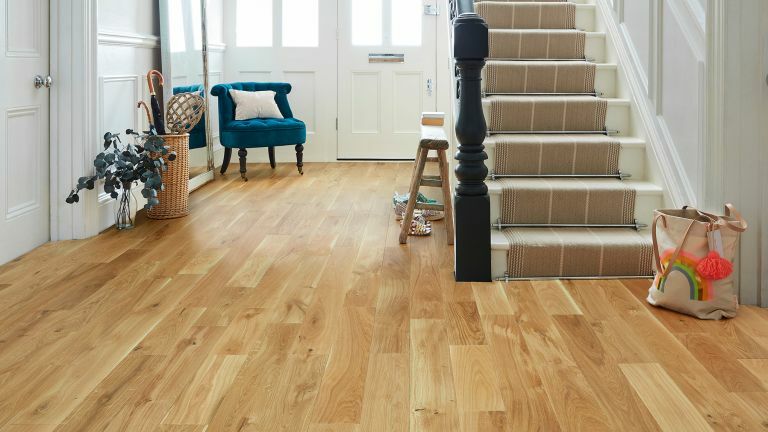 Can solid wood flooring be laid over underfloor heating? Laying solid wood flooring over underfloor heating should be done with caution, as it can cause the timber to dry, shrink and crack. So, before you buy, check with both solid wood flooring and underfloor heating manufacturers that their products are compatible. Where can you lay solid timber flooring? Solid wood flooring can be used in most spaces, such as living rooms, dining rooms, hallways and bedrooms. It should be noted that timber flooring can amplify the sound of footsteps, especially in upstairs rooms, so you might want to use rugs to soften the sound. Some suppliers offer treated solid wood flooring that is appropriate for kitchens and bathrooms, but it is generally not recommended for use in high-moisture areas because the timber may swell and crack. If you do lay solid wood in these rooms, extra care should be taken to ensure that any splashes or spills are wiped up immediately and that rooms are well ventilated. As an alternative, you can get the look of solid wood in a bathroom or kitchen with laminate flooring, a cost effective, practical solution. Solid wood flooring is made from lengths of solid timber, usually sawn into planks around 15mm to 20mm thick and air or kiln dried. Available in various species, oak is by far the most popular for its looks and durability. Flooring can be bought either untreated to stain or oil yourself, or finished with either a lacquer or stain in a particular shade or tone. Some suppliers sell it in different grades depending on the look required, such as character or rustic grades with knots, colour variation and markings, through to prime or select grades that are virtually flawless. Trends for extra-wide boards and distressed or ‘smoked’ finishes are also becoming popular. Reclaimed or salvaged wood flooring are a good choice if you are looking for something with character, but these are often more expensive. With easy-to-fit click-lock systems, many solid wood floors can be installed by competent DIYers. However, since solid wood flooring tends to be expensive, you should only attempt this if you are confident you can do a good job, and if you are also prepared to put in the necessary prep to get the subfloor ready. If you are fixing to concrete, the floor is glued down, and if you are laying it over existing timber, nailing is the best option. Always check the moisture levels of your subfloor and take advice from your supplier, who will also advise on how long the timber should be left to acclimatise in the room before it is laid; some only require 24 hours, while others take longer. Always read the instructions, have the right tools and take your time. Floors look best if you stagger the end joins, so start each row with a different length; poorly finished beading, badly mitred corners and poorly cut boards around radiator pipes are tell-tale signs that a floor hasn’t been laid professionally. Other potential issues to take into consideration are: floors buckling because an adequate expansion gap has not been left around the room; hollow footfalls that can be caused by a void underneath often due to an uneven subfloor; and creaking floors where loose floorboards below haven’t been fixed before laying a new one on top. Incredibly hardwearing, solid wood flooring should last for years. Maintaining solid wood floors by sanding them down and resurfacing to prolong longevity and appearance, and regular sweeping will prevent them from being scratched by grit or dust. A significant scratch or dent might mean the whole floor needs sanding and revarnishing or oiling, so ensure high-heeled shoes are removed and use felt pads or caps under furniture, which should always be lifted, not pushed if moved. Mop the floor once a week or so with a well-wrung mop and use a solid wood floor cleaner that is appropriate for your particular flooring. Where can I find a reputable fitter? Ask your supplier if they provide a fitting service or if they can recommend local tradespeople for the job. Always choose a company whose main business is laying floors and who will want to trade on their reputation. You can’t beat personal recommendations from friends and family. The National Institute of Carpet and Floorlayers will provide you with a directory of its members to contact. A sustainable product, solid wood is generally acknowledged to be ecologically sound; reputable suppliers only deal with manufacturers using wood from certified sources. In the UK, the Forest Stewardship Council is widely recognised and tracks timber from forest to retailer.